January | 2011 | Run. Work. Live. Repeat. A nasty storm is rolling in and my training calls for me to run 50 miles this week, including a 20-miler again by the weekend. But it looks like God and universe may have other plans for me. I’m afraid I’m in for the run-around in the form of bad weather and sickness, not mileage, ahead. That’s the risk you take with winter training. Tarzan woke up at 2 a.m. last night complaining of a headache but he didn’t have a fever, thankfully. I gave him lots of water to drink and some Tylenol. He fell back to sleep somewhere around 3 a.m. It took me another hour to wind down and go back to sleep myself. I was worried he might come down with something and not be able to go to preschool today. I was relieved when he woke up his same peppy self at 7 a.m., ready for breakfast and preschool. We got away unscathed today, but that won’t be the case tomorrow. The district already has announced that Jane’s school will be closed tomorrow. We’re expected to get a boatload of snow with a high temperature of 7 degrees before the storm heads east to causes havoc there, too. It also would not surprise me if Tarzan or Jane still came down with the creeping crud that seems to be making the rounds. “The Dude” just suffered two weeks with the crud. He went into work anyway during that time but he came home every single night and spent all weekend laying in front of the TV with the energy of a banana slug. It was fun times indeed. The most important thing is have everyone healthy from here forward. I’ll do my best to keep the crud at bay and roll with if it comes. I’m preparing for a day tomorrow of cookie-baking, fort-building, crafts, Wii and videos to keep my niños going while El Niño does its stuff. Today I trudged nine miles on the treadmill. If I’m lucky I might get another round of running indoors tomorrow when “The Dude” gets home from work. When I was younger I used to get so frustrated when I experienced the run-around in life. These days I kinda expect it’s going to happen occasionally, even with my training. That’s why I hit it hard today, because you never know what tomorrow will bring. I suppose that is true of anything we face in life. I might as well enjoy tomorrow’s snow day and burn off those extra cookies I know I’ll probably eat when the weather perks up again, on a day when it’s not the run-around. Mileage today: 9; Denver to Boston miles logged: 1,212; Miles left to go: 558. Today’s 16-mile run pushed me hard. I was trying to keep up with a friend who wanted to go the distance but is faster than I am. We also were running with another Double D friend who is more evenly matched in pace to my first friend than I am. The result: I only ran a few of the miles with them. They were too fast for me but I kept them in my sight when I could. It made me run faster than I would if they weren’t ahead of me. I wished I could keep their pace the whole way because it was lonely in spots and tough. That’s just the way it goes sometimes. There were moments I wanted to give up and I didn’t. I’m proud of that. I used that one to avoid the temptation at the half-way point to stop short at 7.5 or 7.75 miles. I went the full 8.0 miles, THEN I turned around. I used that one on the hills. I repeated this one near the end, the last two miles. A final statement to the dissenting voice in my head, which plotted to thwart me earlier. Runner’s World did an article this month on Mantra Magic. If you are looking for some of your own, check it out. It helped me think and run stronger today. 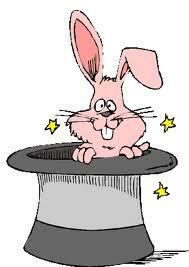 The magic of a mantra is, it’s like pulling a rabbit out of a hat when you need it most. The mind almost always wants to give out before the body will. That’s when mantras really help. 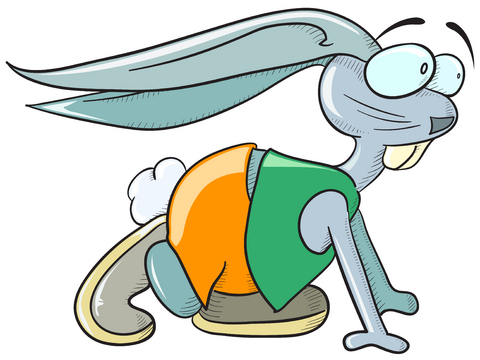 And once in awhile it doesn’t hurt to chase a few rabbits either. Mileage today: 16; Denver to Boston miles logged: 1,203; Miles left to go: 567. Jane’s second-grade class will be doing projects on famous Americans during the next two weeks. Each child had to pick someone, living or dead, who changed history or instituted a significant social change. Jane wanted to profile a famous woman. Her list included Amelia Earhart, Kathrine Switzer and Elizabeth Cady Stanton. Switzer’s bib number was 261. Jane was incredulous when I explained to her that when Kathrine Switzer ran the marathon, she entered the race as “K.V. Switzer.” The organizers assumed she was a man. The rules at the time didn’t allow women to run the marathon. Race officials tried to forcible pull “K.V. Switzer” off the course when they realized what she was doing. The illustration above is based on the famous photo of “the Boston incident,” published around the world in 1967. The thinking back then was that women could not run 26.2 miles safely; it would “hurt” them and their reproductive organs. That’s part of what Kathrine Switzer writes about in her book, Marathon Woman, which tells her story and how she came to believe in herself, run Boston, and buck and reshape the system. It’s a good read, whether you are a female or male athlete, and it’s an interesting view on society’s evolution. “But we’re human, too. Why didn’t they let women run it?” Jane questioned. They just didn’t know yet that we were capable, I explained to her, but because of Kathrine Switzer’s bravery, now we do. 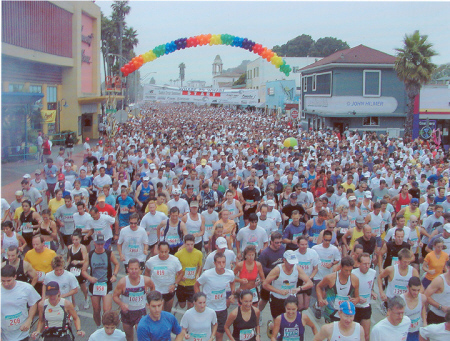 Today thousands of people run marathons each year, and women are the fastest growing demographic. Whether you are male or female, young or old, fast or slower, it doesn’t matter — you can get such a sense of accomplishment through completing a marathon. Maybe someday we’ll do one together, I told her. Who knows? I think Jane is excited because I don’t think any of the other children had Kathrine Switzer on their lists. It will give her a unique perspective when we travel to Boston as a family and I run the marathon. Jane said she would like to bring something back from that trip to show her class . I suggested something that illustrates the history of the American Revolution, so rich and appropriate to Boston, and something about the marathon since that’s the reason we are going. I’m hoping to come away with my own show and tell — namely, a finisher’s medal and my own “marathon woman” story. An homage to “K.V. Switzer” for both Jane and me. Aging in inevitable, but growing old is a choice. Lace up your shoes, and let’s go! Today’s post comes in the form of gear bites — sweet runner products I wanted to share. 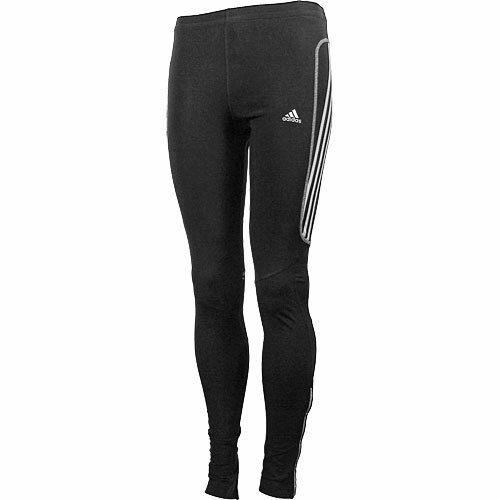 A few weeks ago a friend of mine offered me a shopping discount at a local store and I scored these great tights: Adidas Supernova brushed running tight, P91159 . Here’s a picture of them, at right. When I looked them up online I was surprised to find out that they are in fact men’s tights! I’ve never tried or owned men’s running tights before. I have girly hips, not Deena Kastor’s boy-straight build, but somehow they worked out great anyway. I found them placed in the women’s running section at the store so I guess a clerk made the same mistake I did. When I looked at the tags again later nothing indicated they were men’s. This next item is clearly girly and for women unless you are drag queen running the Bay to Breakers 12K race in San Francisco (a very fun, crowded event, by the way). It’s stylish and practical, and they run $15-$18. I also use it everyday when I’m just doing errands and need to keep my hair back or wash my face in the morning. It’s a good product that delivers what it advertises — keeping your hair back and looking good. It come in tons of colors and designs. I ran 8.25 miles on the treadmill today, including three 1600s at an 7:45 pace for speed work. I’ve got more Boston qualifier profiles in the works. If you know of more women you would like to suggest, please send them my way. Happy shopping and happy Wednesday! Mileage today: 8.25; Denver to Boston miles logged: 1177; Miles left to go: 593. Lately I’ve been daydreaming about drinks with umbrellas in them and pools with swim-up bars near beaches with turquoise waters while I plod the many miles away in the cold. I want what that drink symbolizes for me: completion, success, embracing some much deserved R&R. Maybe I’m feeling this way because of Saturday’s windy run. Or maybe it’s because it’s January in Colorado and blustery outside. Or maybe it’s because on some training days my tired legs feel as watered down as a TGIF margarita. It’s probably a combination of all of the above. Whatever the cause, the effect and outcome is the same. I lust for a day soon where I can swap the lactic acid coursing in my veins for the laziness of Captain Morgan’s in pineapple juice. Yes, I’m glad I’m doing my Boston training and I like many aspects of it. There are just times, like last week, when I’m not running strong, it feels punishing. That fatigue gets compounded by the obligation I feel to complete my virtual log to Beantown. Panic also set in when I took some extra, unscheduled recovery time. What if I can’t make my Denver to Boston mileage goal? Do I give up? Or do I rename the blog and run a shorter distance to a closer East Coast city? Somehow “New York of Botox?” or “Philadelphia or Botox?” doesn’t capture the same je na sais quoi. Just when I thought panic would get the better of me, today’s run (9.25 miles) was a turning point. I felt like I got spring back into my step. I have decided to make some modifications to my training and build in more rest. I’m going to alternate my weeks — running four days one week, five days the other. I’ll throw in extra mileage when I can in the form of more warm-up and cool-down miles. My concern is staying healthy and injury-free. Otherwise I risk not only “Boston or Botox?” but the marathon itself. Run smarter, not harder — that’s my motto, and keep my focus on the big picture. If I can do that, I believe I’ll still make my Denver to Boston mileage goal. When I finally cross the finish line on Bolyston Street I’m going to celebrate afterward with something colorful, festive and fruity. Something yummy I can slurp happily with a pretty umbrella in it. MIleage today: 9.25; Denver to Boston miles logged: 1,168.75; Miles left to go: 601.25. I’m talking about the wind today during my 19-mile-ish to 20-mile-ish training run. I don’t know the exact distance because my Garmin gave out so I ran for just over three hours (that’s about what it usually takes me to complete 20 miles), and I called it good. The gringo translation: it’s time to freeze your tush off. 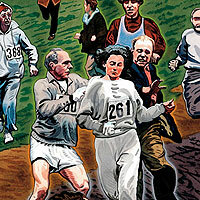 The 5.8 cross-country race often fell on a day with miserable conditions — cold, sleet, snow, ice, wind — you name it. While neither sleet nor ice were a nuisance on today’s route, which was along an exposed bluff, other elements were. A cold wind blasted us the entire way. 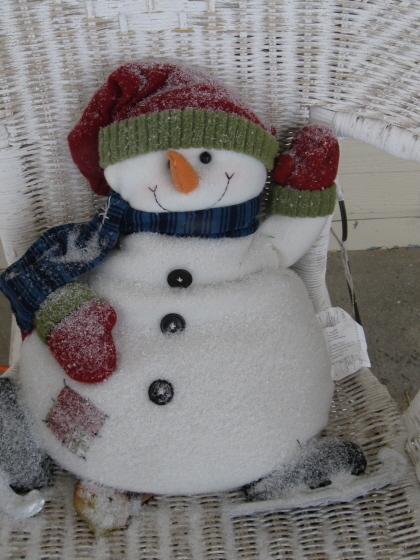 We also got a hiccup or two of snow, but it never stuck. If I didn’t know better, I’d say the ghosts of the Corrida de los Locos from my past visited me today. The distance was the equivalent of running three Locos races back to back. “Hey MOM, can you turn off the wind machine before we get going?’ my friend, Donna S. from the Distance Divas, shouted to me when we started. Just a few miles into the run it felt like we fell into a wind tunnel. Dang Dorothy, I mean, err — Donna — we’re not in Kansas in anymore, but you could have fooled me! 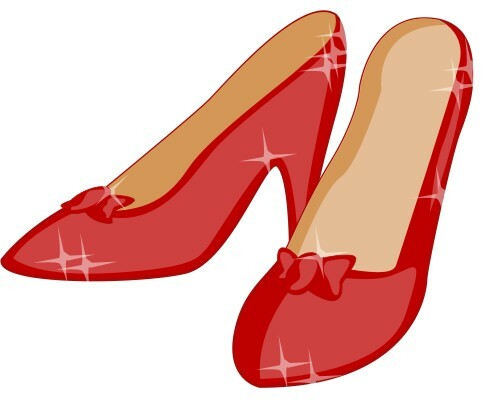 If I had ruby slippers … err … ruby running shoes to click and take us away I would have used them for Donna S. and all of us. I swear the wind picked me up a few times and threw me back. As I crested the hills I pushed against it like a football player tackling a sled in practice down the 50-yard line, and I couldn’t move any faster. It was painful. Luckily another Double D friend, Gayle, ran the full 19-ish to 20-ish with me. It kept me going because every logical part of my brain screamed for me to stop and it took all my willpower not to listen. Why, you might ask, didn’t I stop? I have this theory — that if we can conquer hard conditions in training, then race day should be a breeze (pun intended) no matter what gets blown our way (ditto). Mind games over head winds — I hope it pays off and is true. We’ll see. I will sleep well tonight and I’m grateful for the shelter of my nice, warm home, out of the wind. Aging is inevitable, but growing old is a choice. Lace up your ruby slippers shoes, and let’s go! Mileage today: 20 (revised after I confirmed the distance with my Double D friend who ran with me), and a dose of cold and stiffness; Denver to Boston miles logged: 1159.5; Miles left to go: 610.5. A few days I slogged through a tempo run feeling as rundown as a house decaying in east Detroit. If it were not for a friend of mine who helped me, I don’t know how I would have finished. It’s amazing how some times I can still move as fast as in my 20s, and how at other times I can barely crawl. On the latter days the demolition crew of my forty-something ego wants to pull out the wrecking ball and I compare myself to the elite marathoners. They make training and racing look so much easier than the rest of us. That’s a question I’ve pondered since I read the December 2010 Runner’s World story on Eddy Hellebuyck where he talked about doping — using performance enhancement substances banned from competition — to win prize money and races as a master’s runner. Sure, the elites come to the table with a lot more ability than us mere mortals. It’s sort of like racing greyhounds versus wiener dogs. You can tell who’s going to excel right off the bat. OK — I qualified for Boston. I may not be a wiener dog, but I’m no greyhound either. I’m something in between — perhaps more like the old Dalmatians who used to run with fire engines? I’m not pure speedy but I race with heart. But beyond genetics, just how much of what the elites do is God-given and what part could be enhanced? How many other elite marathoners have done it? How about the female racers? And how about the women elite racers who come back so fast and strong after pregnancy? Are they simply more Superman than the rest of us? Or are they aided, too? Are their performances a combination of both — genetics plus enhancements? What supplements might those athletes be taking that go under the radar? Could they be taking something that is technically legal for competition but doesn’t show up on a drug test but definitely produces an advantage? Could they be taking something that’s not tested for yet? The pressure to perform for them must be off the charts, and so must the temptations. It’s the top racers who get the endorsements and cash prizes. Sure, for the average Joe being 10th overall in the world in the marathon would be the experience of a lifetime. For competitors at that elite level, however, it’s probably not enough to keep Nike and others on board forever. At what point could an athlete be bought out, even if it went against one’s ethics? It’s a good question, not limited to athletics. In my original essay I joked about Botox. I’ve never had a Botox injection and I don’t believe I ever will. For me the idea of “tox” as in “toxin” in my system is a deterrent. However, I understand why others would do it and the social pressure to look younger. I know friends who have. If I were Nicole Kidman or Julia Roberts and earned millions of dollars per movie, and my vanity and vocation depended upon Botox and such, and I, too, might be assuaged. So much of what we read about celebrities is a glimpse of the whole picture in a world that thrives on illusions. When I want to compare myself to them I remind myself of that. I’m not a greyhound. This isn’t my full-time gig like it is for the elites. I don’t work with a legion of coaches, trainers and therapists, and with state-of-the-art equipment and who knows what else. And there’s the X factor that goes into making them what they are that you and I may not know about, and might be kosher or not. Who can tell? As a mere mortal I can listen to my body and do my best. And I can send the wrecking ball of comparisons away to another neighborhood. Today is a rest day — I’ve got a 20-miler slated for tomorrow; Denver to Boston miles logged: 1139.5; Miles left to go 630.5. Powerful and billy-goat strong — that’s how Sue Gallup, 52, of Fort Collins, Colorado, is running these days. That’s not too shabby considering Gallup only took up more mileage and marathoning about five years ago — starting in her mid-40s and into her 50s. 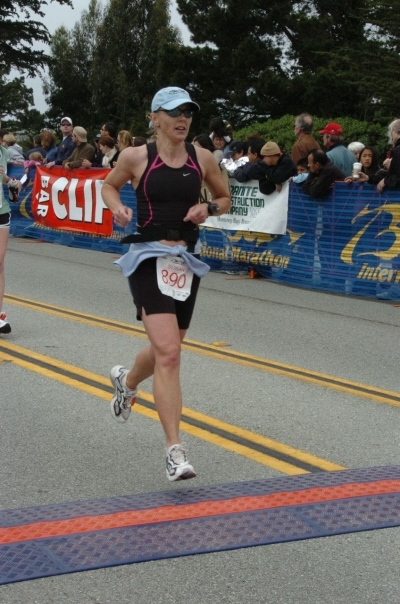 Above is a picture of Gallup crossing the finish line at the Big Sur International Marathon in 2009. She completed Big Sur in 3:57 to qualify for Boston. Big Sur, described as a “moderately difficult course” with a six-hour cutoff, according to its web site, was only her second marathon. Her first was the Jungfrau Marathon in Switzerland — a breathtaking course in Alps that requires true billy-goat stamina. Here’s a picture of runners from the Jungfrau race. Gallup said she loves mountaineering and scenic courses. A native of Washington state she grew up competing in ski racing. She used to run for fitness as part of her dry-land training. She’s lived in Colorado for several years, works for Hewlett-Packard as an engineer, and enjoys trail running and living in the Rocky Mountains. Gallup trains with Kent Oglesby, the head track coach at Rocky Mountain High School in Fort Collins and a himself seasoned national runner. “He’s an awesome coach and so encouraging. He pushed me harder than I thought I could go and made me so much stronger,” she said. Gallup planned to run the Boston Marathon in April 2010 but got side-lined by a case of plantar fascitis. She took three months off, but got her entry deferred. She will run the Boston Marathon instead this year. During her recovery time she cross-trained by rowing at a local reservoir. During the last several months she’s gradually returned to running. “Dealing with the injury was a really humbling experience,” she explained. She’s also planning to run the Steamboat Half Marathon in June. As you get older you can succeed at staying fit, but it takes more vigilance, she said. You have to stretch more often, stay limber, listen to your body, get good sleep and eat better. Mileage yesterday: 7.5, mileage today: 6; Denver to Boston miles logged: 1,131.5; Miles left to go: 638.5.